What makes diamonds a girl’s best friend? What is the reason that girls in Palm Beach find diamonds so captivating? Why are these gemstones so utterly captivating? Sparkling, brilliant and bright, diamonds have been an inspiration for generations to come. This could be from the way they reflect light so delicately, for their value or their rarity. Of all substances on earth, diamonds are the hardest. Plus, they symbolize eternal love which has totally seeped into the popular conscience and culture. There are a lot of superlatives when it comes to diamonds in Palm Beach and around the world. Not only are they the best heat conductors and the hardest thing known to man, they are also formed a hundred miles below the Earth’s surface and survive rapid eruptions of volcanoes to bring these to the surface before they are mined or found. Most diamonds are between one and three billion years old and have been valued since three thousand years ago. The most beloved and desired of every gemstone, diamonds can be found in every type of jewelry including bracelets, necklaces, earrings and watches. Perhaps, diamonds are known best for their significance in wedding and engagement rings, where they symbolize commitment, love and romance. No matter what jewelry you find a diamond in, these gemstones have positive qualities distinguishing them from every other gem. There is more meaningful symbolism associated with a diamond compared to any other gemstone. Due to their quality of being virtually indestructible, diamonds are associated with being flawless and perfect. It is also a symbol of commitment and eternal love. When giving diamonds to a loved one, you are doing so much more than offering a gemstone. You are actually communicating everything a diamond symbolizes. Renowned for light reflections that dazzle and captivate the human eye, diamonds are known for their clarity. Over a broad spectrum of light, diamonds are transparent compared to other solid or liquid substances, including infrared light and ultra violet light. To maximize its natural clarity, the way the diamond is faceted or cut does matter. Besides the white traditional color of a diamond, these gemstones come in various colors, including yellow, green, blue, pink and chocolate brown. Few other gems come in such a variety of colors the way diamonds do, and yet the diamond is still the most durable of them all. Of all the gemstones, diamonds are not only the hardest, but in nature, are the hardest of substances. As a matter of fact, of any material, diamonds have the highest tensile strength and of any material, have the 2nd highest strength of compression. These are thus long lasting and durable and able to withstand trauma of all types. A diamond is durable enough to be handed down for many generations with no signs of having been used. While in Palm Beach, you might want to check out the flawless gemstones available at Gray and Sons. Whether you are looking for loose stones, vintage settings, estate jewelry, modern settings or brand new diamond jewelry, this is the jeweler to patronize. Having been in the business for the past thirty years, you can be assured of the highest quality stones at Gray and Sons. Visit us at the Gray and Sons Showroom! Whether you are purchasing diamonds jewelry for someone or as a personal investment, you might want to check out the broad array of jewelry at Gray and Sons, conveniently pre-selected with utmost discernment. With such a significant purchase at stake in the area of Palm Beach, it is to your advantage to deal only with the very best in the business. Gray and Sons gives you the highest appraisals as well as the best selections of diamond jewelry to choose from. In Florida, the town of Palm Beach offers a fascinating array of culture venues, restaurants, and some of the best shopping around the globe. Attractions in this area include Mar-A-Lago, Four Arts Gardens, Breakers Hotel and the Flagler Museum. You might also want to check out Worth Avenue and Pan’s Garden while you are in the area. In Palm Beach, get the best deals on diamonds and diamond jewelry by knowing which jeweler gives the best appraisals. 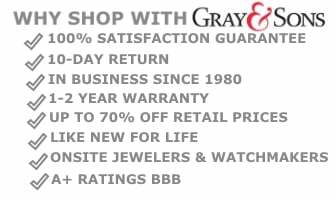 Gray and Sons features with over 30 years experience, offers expert appraisals and without a doubt the most professional jewelry analysis. Not only will you find a vast selection of some of the finest pieces to choose from, you can also rest assured that when it comes to diamonds, you are in good hands at Gray and Sons. Palm Beach Jewelry includes diamond pieces in brooches, tiaras, watches, rings, necklaces and bracelets to meet your needs. 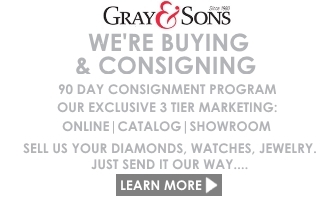 Whether you are looking for estate jewelry, vintage pieces, modern pieces or fine jewelry, Gray and Sons does not disappoint. In Palm Beach, buy and sell jewelry from those who know what they are doing. There is no need to risk such a significant purchase in this location. Gray and Sons will meet all your diamond jewelry needs no matter what pieces you are interested in. Sell Your Diamond Jewelry to Gray and Sons, Palm Beach! Whether you are in the market for a brand new diamond engagement ring, other types of diamond jewelry or are thinking of selling your own personal diamond jewelry, you will get the best appraisals at Gray and Sons, Palm Beach. After all, with credibility and accreditation that has been verified for three decades, you know you are in safe hands at Gray and Sons.